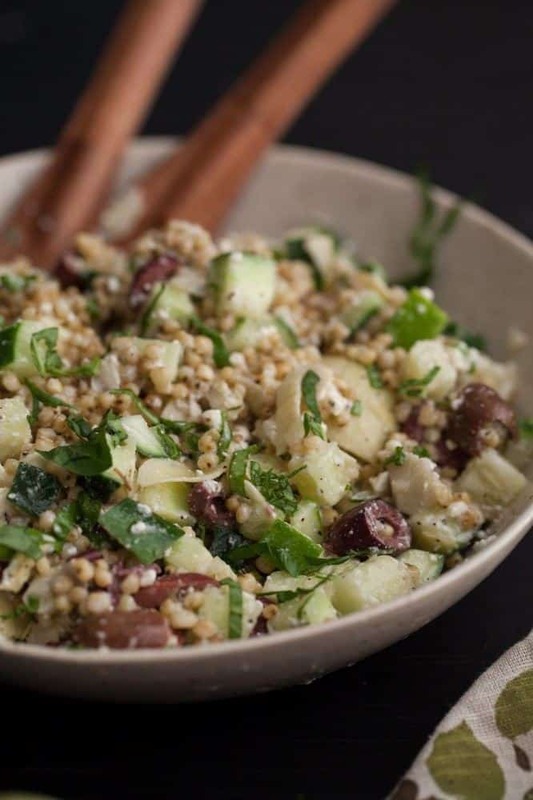 Sorghum Salad with Cucumber and Feta | Naturally. I’ve had some variation of this sorghum salad tucked away for a bit now. It started out fairly simple: sorghum, cucumbers, and red onions but morphed into this version I’m sharing today. While I was home over the holiday, I went to make the earlier version but after thinking about it, the sorghum salad felt a bit bare. It was at this point that I started to dig around in the refrigerator. A bit of feta? Great! Some olives and artichokes- makes it even better! I stopped short of tossing everything in (I was eyeing the sun-dried tomatoes but decided to leave those out.) And I’m sure you might be tired of seeing sorghum from me but I’m in love (it’s like that person you just started dating and that’s all you can talk about, sorry friends!) I’ve always loved pearl couscous and sorghum is roughly the same size but has a bit of chewiness to it. 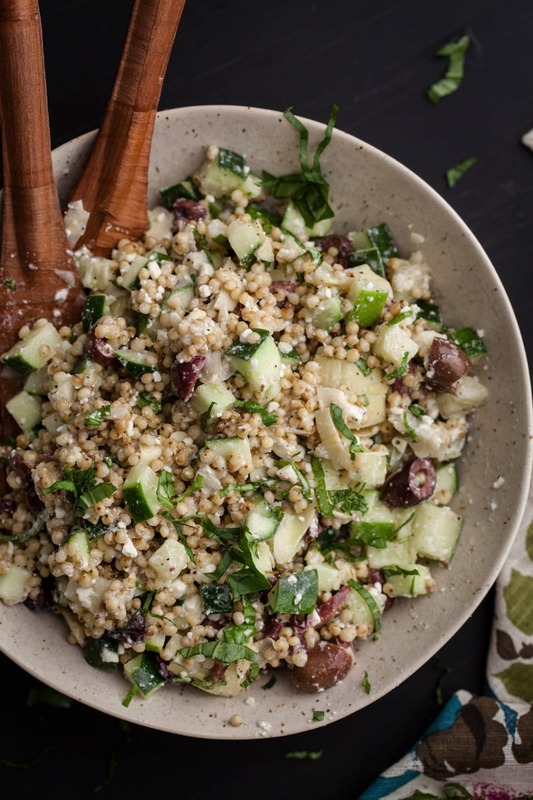 Combine sorghum, olives, artichokes, scallions, basil, and feta in a large bowl. 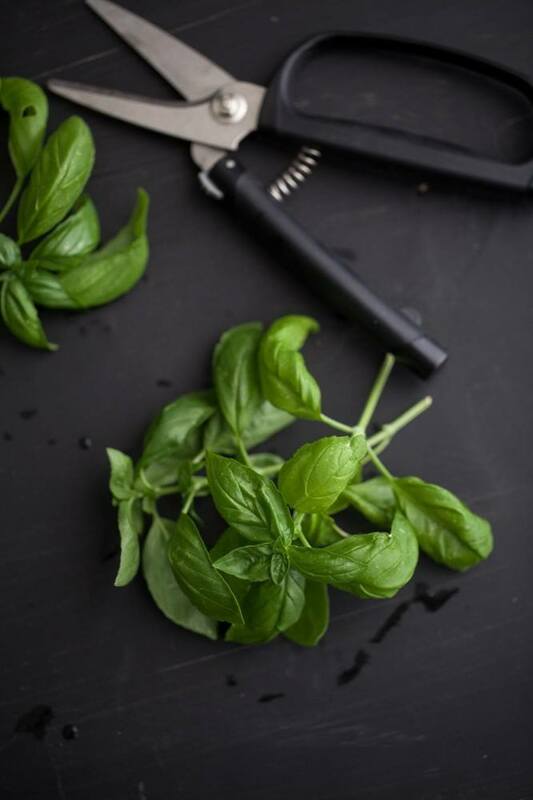 In a small bowl, whisk together olive oil, lemon juice, and black pepper. Pour over salad and toss to combine. *I typically keep jars of Kalamata olives and marinated artichokes in the refrigerator for odd and end uses, however, non-marinated versions would work just as well. What can be optionally be used for sorghum??? So simple and delicious! This kind of salad is exactly what I want to eat for dinner all summer long. Although I have never yet tried sorghum! Definitely need to keep an eye out for that one in the future. 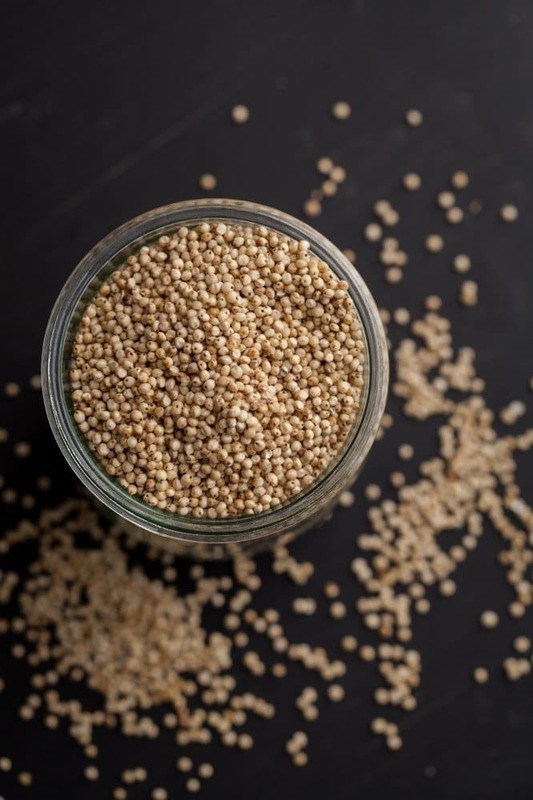 Where to you get your sorghum from? I tried Bob’s Red Mill a while back, and it tasted very dirty and not at all good. 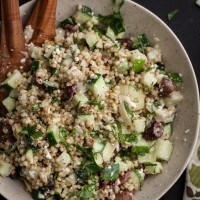 Hi Erin, beautiful salad, never have tried sorghum before, just put it on my list. Thanks for sharing! 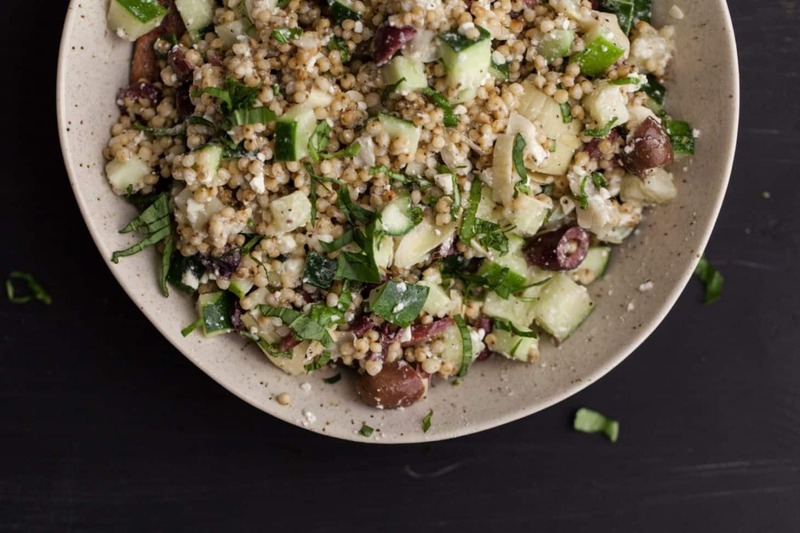 love this salad.. never used sorghum before – something that i need to try. thanks for sharing! I’ve been searching high and low for sorghum ever since I saw Kate use it on Cooke & Kate and I can’t seem to find it anywhere. I love a Greek salad and this looks so fresh and delicious, I guess I need to hunt around a little more! I made this last night using farro. It was easy and delicious with lots of flavor. Your recipes are great for two people and this recipe was no exception. I was thinking of making it with farro, which I love. I’m glad to see it was a success. 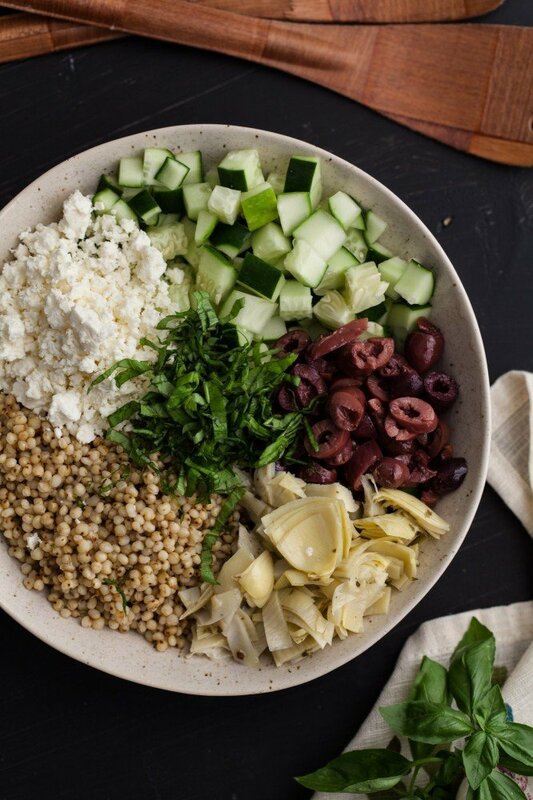 These Mediterranean flavors sound so refreshing all mixed up together! I think you did a great job adding just enough to make it extra interesting. All my favorite flavors. I need to try this! This is the first time I have made anything with sorghum in it! I cooked the sorghum in homemade chicken broth …which probably took a bit longer than you had said in your description. I had all the ingredients except the artichoke hearts, the scallions and fresh basil. I used half of the lemon, dried basil, a small handful cranberries and a small handful of pumpkin seeds. This salad rocked! Kudos on a great recipe and passing it on!